The Wilson Combat Technologies ADP (Advanced Design Pistol) has been advertised for over a year, but this was the first one I had come across. 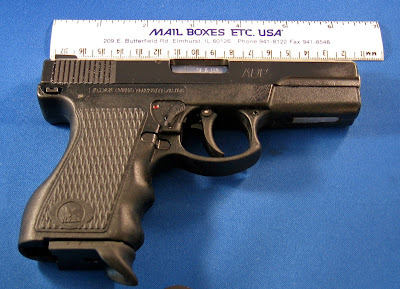 The ADP is a small, double action, striker fired 9mm pistol. 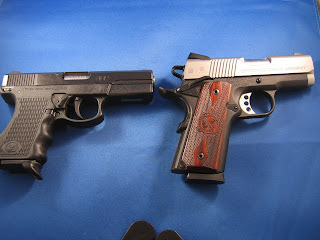 Wilson Combat Technologies is known for their custom made, handfit , high performance 1911 pistols. They start just over $2K and top out at between five and six grand. The ADP is their first attempt at a production pistol and they have chosen to go fill the niche for the concealed carry permit holder who wants the smallest, shootable defensive caliber gun he or she can get. Here’s what I mean by that statement. The ADP is larger than many small pocket pistols. However those that are smaller generally run with a lesser caliber and what good does a mini-handgun do you if the caliber isn’t capable of inflicting a fight stopping injury, or you miss because it is so devoid of anything resembling sights or throw your shot because of the amount of recoil the teeny gun inflicts when you fire. · It is “just barely” small enough to be a pocket pistol. · The grip and magazine extension are “just barely” long enough for me to get all four of my fat fingers around. 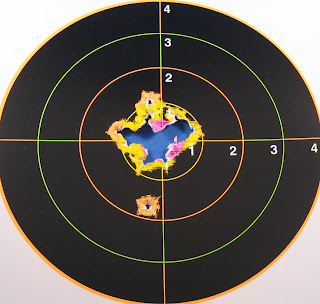 · The 9mm caliber, 10 +1 capacity, and fifty foot accuracy are “just barely” good enough to make it a viable defensive pistol rather than merely a back-up gun. 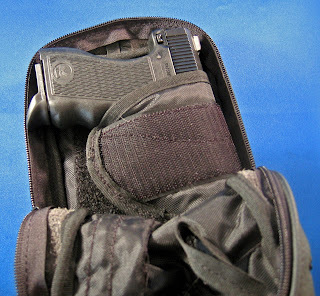 The ADP is at the top of the scale for pocket pistols and I mean just at the edge of requiring a belt holster but it does fit very nicely in my pocket holsters from DeSantis and Galco. This Wilson pistol is thinner and shorter in height than my Springfield EMP. It is also thinner and shorter in height than my Smith & Wesson J-frame model 340. Along with that it has a longer barrel which means longer sight radius and a better double action trigger. All of this means it is easier to shoot and shoot accurately than the J-frame revolver which is the pocket gun standard. Plus the ADP’s 10 + 1 rounds give you one more than double the capacity of the small 5 shot revolver. As you may be able to tell from the photo, the ADP sits very low over the axis of the thumb and trigger finger. This assists in recoil recovery for follow-up shots. So, what else is favorable on this pistol? · It has night sights.  · There are absolutely no sharp or squared edges on the pistol. 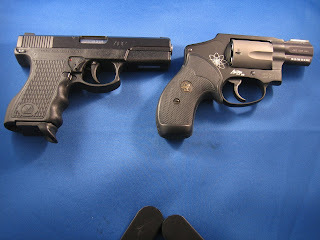 So many of the small handguns that I have tested have severely beat up my hand and/or cut into my trigger finger. The ADP is actually pretty easy to shoot. 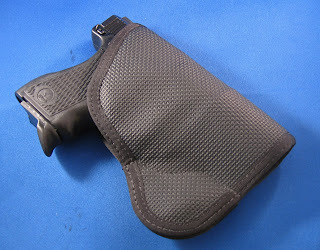 · The rounded contours of the grip make it very comfortable to hold and assist in recoil recovery. · It has a manual safety which is in the form of a lever mounted just above the magazine release on the frame behind the trigger area. Some may feel that a manual safety is not necessary on a double action pistol. 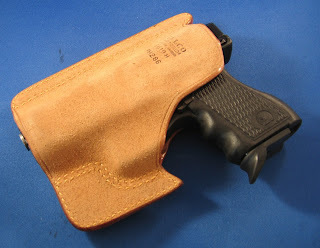 Myself, I think it is a good idea on a pocket pistol that may be carried without the benefit of a holster to keep the trigger from accidently getting pressed. If you are going to engage the safety then you need to practice engaging and disengaging it so that this process becomes a part of your normal muscle memory when handling the pistol. Any drawback? None really for me. In the April/May edition of The American Handgunner magazine Charles Petty reviewed the pistol and declared it to be the “Thinking Man’s Pistol”. I have no idea exactly what he meant by that, but I think I liked the pistol a whole lot better than he did. Petty said that the handgun was not easy to shoot. I beg to differ; I thought it was great fun. Petty’s fingers also ran afoul of the safety and magazine release. I had no problems there either. One of the things Petty failed to mention was how hot this pistol gets. After 50 rounds you will definitely want to put it down and let it cool off. This is due to the gas piston recoil system. The ADP contains a gas piston almost exactly the same as the Heckler & Koch M7 line of pistols. This allows the ADP, like the H&K M7, to fire from a fixed breech/barrel configuration and the fixed barrel helps with accuracy. 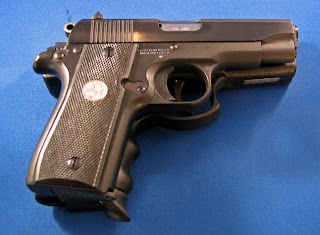 Most common larger caliber blow-back operated pistols require a floating and removable barrel. However, the piston on the ADP pushes the hot gasses created in the pistol when it is fired into the piston which heats the gun up quicker than a blow-back design that allows the gasses to escape. If there was one part of the pistol which could bear improvement it would be the trigger. When some people pick up this pistol they see that it is a Wilson and expect one of their hand-tuned triggers. Those people are disappointed. 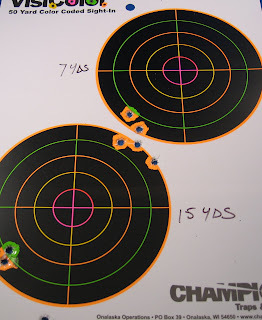 While the trigger is not great, it is not nearly as bad as many double action pistols I have tested. Those who are disappointed with the ADP’s trigger would do well to remember that it is a quarter of the price of the lowest cost Wilson custom 1911. 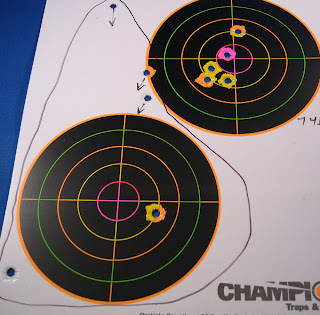 I found that the ADP shot very well at the 7 yard line but became a little more challenging at 45 to 50 feet. 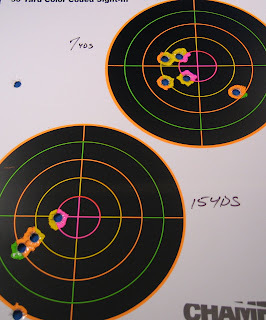 I shot some Magtech 115 grain hardball at 7 yards to warm up and then fired 8 different types of defensive hollowpoints. Reliability was flawless but performance with the hotter hollowpoints differed. 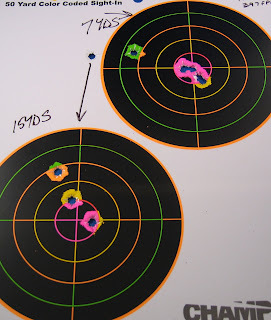 To conserve space I am not going to report on all of the different rounds but rather offer up a few from both ends of the spectrum as well as this observation; the ADP prefers lighter (115 grain) to heavier (147 grain) ammo.